Background Pharmacists are increasingly involved in patient care. This new role in a complex healthcare system with demanding patients may lead to moral dilemmas. There has been little research into pharmacy ethics, and existing data are limited by their retrospective nature and small sample sizes. A thematic overview of the moral dilemmas experienced by community pharmacists is still missing. Objective To make a thematic overview of moral dilemmas experienced in daily pharmacy practice. Setting Dutch community pharmacy. Methods Dutch community pharmacists wrote a narrative about a moral dilemma they had experienced in clinical practice. The narratives were analysed using qualitative content analysis to identify underlying themes. Main outcome measure Themes of moral dilemmas. Results Twenty-two themes were identified in 128 narratives. These moral dilemmas arose predominantly during pharmacists’ contact with patients and other health professionals. The relationship between the pharmacist, patient and other health professionals was complicated by other parties, such as legal representatives, health insurance companies, and regulators. Conclusion The moral dilemmas experienced by community pharmacists are more diverse than previously reported. The main dilemmas arose in their professional contacts, frequently when their professional autonomy was challenged by the behaviour of patients and other health professionals. The moral dilemmas for pharmacists are diverse, but underlying is often a troubled relationship with physicians and/or patients that hampers the pharmacist to deliver appropriate pharmaceutical care. Reflection on moral dilemmas may help community pharmacists to strengthen their professional autonomy. Investing in good professional relationships with other health professionals and in a therapeutic relationship with patients may benefit recognition of pharmacists’ expertise. Worldwide, the primary focus of pharmacists is shifting from products to patients [1, 2, 3, 4, 5, 6, 7]. This patient-centred approach means that pharmacists have to identify patients’ concerns and needs, and collaborate closely with other health professionals in order to ensure effective and safe use of medicines . Lastly, pharmacists are responsible for helping patients to achieve definite health outcomes. Nowadays, health professionals such as pharmacists are faced with ever more regulations, financial pressure, and increased competition. At the same time, the demand for health services is growing as a result of population ageing, more chronic illnesses, and increased healthcare consumerism [9, 10]. Economic and legal constraints and demanding patients challenge health professionals’ autonomy to act in the best interests of society and the individual patient [9, 11, 12, 13, 14, 15, 16, 17, 18, 19]. In this complex setting, pharmacists are frequently confronted with moral dilemmas [20, 21, 22, 23, 24, 25, 26, 27, 28, 29, 30] arising from conflicting personal, professional, institutional or societal values of the different parties involved [28, 31, 32, 33]. These moral dilemmas need to be studied in order to address the challenges pharmacists face in their professional role [24, 29, 30, 34, 35, 36, 37, 38, 39]. There have been few international studies of the moral dilemmas experienced by community pharmacists, and existing studies vary widely in aim, method and presentation of results [24, 25, 26, 27, 29, 30, 40]. In most existing studies, pharmacists were presented with scenarios of moral dilemmas and their moral reasoning was assessed. Pharmacists found it difficult to recall moral dilemmas and most studies interviewed a limited number of pharmacists [20, 21, 22, 23, 30, 41]. Hence the themes of moral dilemmas experienced in clinical practice may still be incomplete. We aimed to make a thematic overview of moral dilemmas community pharmacists actually experienced in clinical practice. The Medical Ethics Review Committee of the University Medical Centre Leiden concluded that the Dutch Medical Research Involving Human Subjects Act (WMO) was not applicable. All participants consented that their narratives could be used for the purpose of the study. Data that could give clues about the origin of dilemmas (e.g. names of patients, cities, pharmacies, pharmacists or physicians) were removed. 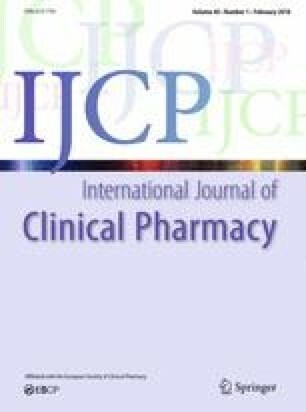 Pharmacists wrote a narrative of a moral dilemma they had experienced in clinical practice, as an assignment during either pre- or postgraduate training. The pharmacists were asked to write this narrative immediately after they had experienced the dilemma. A stratified random sample of these narratives was taken. All pharmacists had been taught how to recognise moral dilemmas. This study followed scientific standards for reporting qualitative research (SRQR; see “Appendix”) [42, 43]. On the basis of the various definitions in the literature [25, 29, 35, 40, 44, 45], a ‘moral dilemma’ was defined as: a situation in which there is a choice between at least two courses of action, neither of which is obviously morally preferable. Narratives were checked against this working definition by both the first author (MK) and a member of an expert panel consisting of eleven senior pharmacists active in the special interest group on pharmacy ethics of the Royal Dutch Pharmacists Association. All panellists had been trained in a half-day ethics course to identify moral dilemmas. If consensus was not reached, a third pharmacist from the research group (WG, MB or AF) was consulted. Narratives that did not comply with our working definition were excluded. Inductive content analysis of narratives to identify themes of moral dilemmas was facilitated with ATLAS.ti (version 7.5.17) . Consensus on final themes and main categories was reached in two rounds, during independent validation by the research group and during a consensus meeting with both the expert panel and research group. Of the 220 narratives, 92 were excluded (Fig. 1). The included 128 narratives were written by pregraduates (49%: 51% male, 49% female) and postgraduates (51%: 39% male, 61% female). Twenty-two themes were identified, divided into three main categories (see Table 1). Below, we illustrate the themes with a brief summary of a dilemma and quotes from pharmacists that reflect the essence of the theme. Patients who had (or were suspected to have) drug abuse or addiction problems requested for refills too soon. The drugs involved were mainly controlled drugs such as opioids or benzodiazepines. Pharmacists grappled with the problem of possibly sustaining addictive behaviour on the one hand and the need to retain patients’ trust and to relieve pain or anxiety on the other. Drug misuse can lead to side effects or affect the effectiveness of the prescribed medicine. Pharmacists expressed concern about confronting patients without losing their trust. Dispensing without addressing the issue also had drawbacks. Patient treatment preferences might not be supported by evidence-based medicine or professional guidelines. In these situations, the pharmacists considered patients’ preferences potentially ineffective or harmful. Claiming or aggressive behaviour of patients undermines the trust-based relationship pharmacists have with patients and frustrates pharmacists because it might prevent them from providing adequate care. This is a complex situation, especially if there are other patients waiting in the pharmacy. Patients (or their carers) who had difficulties understanding drug information because of language deficiency or limited health literacy, posed a particular problem. Pharmacists doubted whether these patients would use the drug safely, but not dispensing was not an option if the patient clearly needed treatment. Sharing patient data with either health professionals or informal carers may be necessary from a clinical perspective. Dilemmas occurred when the pharmacist felt a need to share data, but patient’s consent to share data was absent or patients even requested not to share these data. PHARM-252: A woman treated for a bipolar disorder told her pharmacist that she wanted to discontinue mirtazapine. She explicitly asked the pharmacist not to notify her psychiatrist. “I explained to her that I couldn’t provide proper pharmaceutical counselling because I didn’t have relevant background information.” Although the pharmacist wanted to respect her autonomy, he also felt he should notify the psychiatrist. In general, current health policy is directed at curbing increasing health expenditure. Dutch health insurance companies reimburse only generic products unless the physician has medical reasons for prescribing a branded drug. While pharmacists recognised their responsibility to reduce health expenditure, this also disturbed their relationship with patients who strongly objected to generics. PHARM-84: A patient, objected strongly to generic salbutamol. “After persistently trying to explain the drug reimbursement policy to him, I convinced him to try the generic for at least 14 days. A few hours later, he reported numerous complaints. Later the patient came with a prescription for the branded aerosol and a statement from his physician declaring the necessity of him having the original drug. Somehow, I felt the patient had never really tried the generic.” The pharmacist had doubts about whether he should start the conversation with the patient again or fill the prescription. Pharmacists described situations in which the relationship with physicians was troubled. Sometimes physicians even behaved disruptively e.g. by not listening to the pharmacists’ pharmacotherapy suggestions. This deprived the pharmacists of relevant information and caused frustration because their expertise was not appreciated. Pharmacists had reservations about the safety or effectiveness of prescribed treatment. Not dispensing, however, was equally problematic because reasons for the chosen treatment might have been valid. Moreover, pharmacists were anxious to further disrupt their professional relationship with the physician. Pharmacists reported disruptive behaviour of colleagues, such as gossip, lying or suspected fraud. Both neglecting and addressing such behaviour could influence the work climate in the pharmacy. In these dilemmas physicians ‘overruled’ pharmacists’ proposals, although not necessarily in a brusque manner. Pharmacists had the idea that the physician did not really consider their suggestions and doubted the suboptimal or unsafe pharmacotherapy. Pharmacists felt at a disadvantage because they lacked sufficient knowledge about the patient’s condition. Moreover pharmacists did not want to further disrupt their professional relationship with the physician. Pharmacists had a moral dilemma when they wanted to deviate from a prescription because of potential drug related problems such as interactions or allergy warnings, or to discuss the treatment because lack of relevant clinical data, but could not contact prescribers. Both situations impeded their judgement on the appropriateness of pharmacotherapy. PHARM-350: A dentist prescribed amoxicillin. The pharmacist knew that the patient had previously had an allergic reaction on amoxicillin. The dentist could not be reached, but the patient urgently needed medication. “What if the dentist does not agree with the alternative antibiotic clindamycin? Pharmacists had a conflict of loyalty when their decisions would either affect their professional relationship with colleagues or result in suboptimal patient care. PHARM-1176: A physician prescribed midazolam for himself. “Dispensing felt problematic because sleep medication might have negative effects on the physician’s daily functioning. Moreover, the pharmacist did not want to become the accomplice of an addicted physician. However, not dispensing could damage the professional relationship and future collaboration. The previous categories of dilemmas involved patients or health professionals. In the following themes other ‘stakeholders’ were involved, such as health insurance companies and manufacturers. We also included dilemmas with (unborn) children and adolescents in this category, as pharmacists in these situations have a complex responsibility towards these unborn children, minors and their parent(s) or legal representatives. Pharmacists experienced dilemmas when patients were not insured and not able to pay their medication out of pocket, because these patients needed their medicines. Also, concerns about pharmacy workload sometimes conflicted with pharmacists’ wish to deliver optimal but time-consuming patient care. Providing additional services for some patients would mean compromising on other services. Pharmacists confronted with off-label prescriptions for children and adolescents felt they could not appropriately assess the risk–benefit ratio or the correct dosing of drugs. Another dilemma was when children collected medication. Pharmacists worried about the possibility of the child misusing the medication, but also did not want the patient to be left without medication. Even more complicated moral dilemmas arose when medication was prescribed to pregnant women. In these cases, pharmacists had to weigh the benefits for the mother against the potential risks for the unborn child. These dilemmas concern euthanasia or palliative sedation. Dutch Pharmacists’ and Physicians’ Associations have a joint guideline on providing euthanasia . Sometimes physicians did not adhere to the guideline recommendations; e.g. a physician requested euthanasia drugs without timely communication with the pharmacist. Pharmacists were then reluctant to cooperate. However not dispensing felt wrong because the patient was suffering. The dilemmas that dealt with palliative sedation concerned both disagreement about the dose of palliative sedation and the expectations of physicians that pharmacists would have the necessary drugs readily available. Patients regularly requested (restricted) medicines without a (valid) prescription. In these situations, pharmacists had to balance the necessity and risks of dispensing. Pharmacists felt it hard to make this balance because they had insufficient clinical information and were reluctant to deviate from laws and regulations. These moral dilemmas were related to uncertainty about the quality of a pharmaceutical product and the risks of dispensing a product that might be ineffective or harm patients. PHARM-309: A patient visited the pharmacy with three golimumab injections worth €3500 which had been outside the refrigerator for about 1 day. “The manufacturer told me they expected no quality issues but could not give any guarantee.” The pharmacist doubted whether the patient would be harmed by using the injections, and felt that, given their cost, discarding the injections was not socially responsible. This study presents moral dilemmas experienced by community pharmacists in clinical practice. The underlying themes address the challenges pharmacists face while providing care in a complex setting with economic and legal constraints, demanding patients and limited professional autonomy. Analysis showed that most moral dilemmas concerned the relationship between pharmacists, patients and physicians. This is not surprising considering that pharmacists are responsible for helping patients achieve positive health outcomes, and this responsibility requires that they work with patients and other health professionals . As far as we know, no previous study used narratives to understand the moral dilemmas that pharmacists experience in clinical practice [26, 29, 40]. Writing a narrative shortly after a dilemma occurred avoids recall problems and enables pharmacists to reflect directly on their feelings. Previous studies generally interviewed pharmacists and asked them to recall dilemmas that occurred in the past [29, 40]. This may be the reason why, in those studies, pharmacists mainly recalled dilemmas with a high legal impact. For example, pharmacists expressed fear of breaking the law when a patient asked for a controlled drug without a (valid) prescription [26, 29, 40]. When legal issues occurred in this study, pharmacists were more concerned about the patient’s well-being and the mutual trust in the treatment relationship than about breaking the law. Pharmacists experienced dilemmas during their professional contacts because the behaviour of patients and physicians made it difficult for them to act autonomously, according to their professional core values . Since the days of Hippocrates, health professionals’ core value is not to harm patients and to act in their best interest. However, conflicts may arise when more than one health professional aims to act according to that value. The degree of professional autonomy of an individual health professional depends on the extent to which other health professionals grant that autonomy . Regular collaboration between pharmacists and other health professionals may promote mutual trust and respect for each other’s knowledge and expertise [52, 53, 54]. Pharmacists’ autonomy may also be challenged because pharmacists are often the last link in a multidisciplinary care chain, e.g. in end-of-life pharmaceutical care issues. In that position pharmacists’ expertise comes into play too late or is not recognised [55, 56]. Pharmacists in these situations described that their expertise was disregarded and that they were expected to dispense only. These moral dilemmas demonstrate that pharmacists need more training to convince physicians of their expertise. The professional autonomy of pharmacists may also be restricted by patients or parties such as insurance companies or the health inspectorate. Patients may also consider physicians to have more authority than pharmacists. This can sometimes lead to claiming and/or aggressive behaviour of patients. This behaviour undermines the trust relationship between the pharmacist and the patient. This resembles healthcare consumerism, which is reported to challenge the ability of health professionals to optimally fulfil patients’ and societal needs [9, 10, 11, 12, 13, 14]. Dilemmas under the theme public health policy and third-party payer regulations showed that health insurance companies can also undermine pharmacists’ autonomous professional decision-making and actions. Insurance companies oblige pharmacists to replace expensive branded drugs with cheaper generics. Although pharmacists do not object to dispensing cheaper medicines whenever possible, this responsibility also disturbed their relationship with patients who strongly objected to generics. This finding confirms a worldwide trend that economically motivated health policies challenge the professional autonomy of all health professionals [12, 13, 14, 17, 18]. Health policy makers should realise that weakening health professionals’ autonomy, for example due to reimbursement policies, may negatively affect patients’ trust in health care . This study has some limitations. Firstly, the moral dilemmas were reported by ‘early career’ pharmacists. These pharmacists may be more committed to patients’ well-being, because of more advanced training on the patient perspective than earlier generations of pharmacists. Moreover, the training provided might have influenced their sensitivity for moral dilemmas . The themes underlying the moral dilemmas were not less numerous than those in previous studies involving more experienced pharmacists. Exceptions to this are primary business dilemmas. The underreporting of these types of dilemmas might be explained by the fact that the early career pharmacists in our study generally do not own a pharmacy. A second limitation is that saturation of themes was not formally assessed. We did, however, have no clues on additional themes from the excluded narratives. Moreover, screening of an additional stratified random sample of 50 narratives by two authors (MK and MB) neither gave clues on missed themes. Therefore, we are of the opinion that the most important themes for the Dutch context are identified. This does, however, not imply that every individual pharmacist will identify these dilemmas. Furthermore, our results are not completely generalizable to countries with different health systems and a different position of the community pharmacist in health care. Lastly, the written narratives contained much richer information than reported in our brief summaries; some narratives were excluded because they were unclear. As we were primarily interested in the themes, we did not analyse the feelings of pharmacists in depth. This study suggests that a short training enables pharmacists to write narratives on moral dilemmas they experience in clinical practice. Reflecting on these dilemmas may help pharmacists to increase their professionalism. Hence, we suggest to integrate such ethical training in experiential learning within both pre- and postgraduate education. This will raise pharmacists’ awareness on moral conflicts and will support the profession’s transition to delivering pharmaceutical care. Pharmacists experience a number of moral dilemmas in clinical practice. The narrative method enables pharmacists to reflect directly on their feelings at the time these dilemmas occur. Most dilemmas involve the pharmacists’ professional relationships and often arise when the professional autonomy of pharmacists is challenged by patients’ and other health professionals’ behaviour. We express our gratitude to all the participating pharmacists who shared their moral reflections with us. Also, we want to thank the pharmacists who participated in the expert panel. We received unrestricted grants from the Royal Dutch Pharmacists Association (KNMP) and from the foundation ‘Stichting Management voor Apothekers en voor de Gezondheidszorg’ (MAG). All authors declare that they have no conflict of interests that are directly relevant to the content of this study. Further, all authors are aware of this submission and agree with it. Wiedenmayer K, Summers RS, Mackie CA, Gous AGS, Everard M, Tromp D. Developing pharmacy practice: a focus on patient care Handbook-2006 edition. World Health Organization (WHO), International Pharmaceutical Federation (FIP). http://www.fip.org/files/fip/publications/DevelopingPharmacyPractice/DevelopingPharmacyPracticeEN.pdf. Accessed 8 Jan 2016. FIP. Reference Document. Pharmacist ethics and professional autonomy: imperatives for keeping pharmacy aligned with the public interest. International Pharmaceutical Federation (FIP), 2014. http://www.fip.org/www/uploads/database_file.php?id=358&table_id=. Accessed 14 Jan 2016. Deans Z. Ethics in pharmacy practice. Pharmacy Practice Research Trust, 2010. http://www.pharmacyresearchuk.org/waterway/wp-content/uploads/2012/11/Ethics_in_pharmacy_practice_200910.pdf. Accessed 12 June 2016. Mackenzie N. Research dilemmas: Paradigms, methods and methodology. Issues In Educational Research. 2006;16. http://www.iier.org.au/iier16/mackenzie.html. Accessed 15 June 2016. De Veer AJE. Morele dilemma’s in het dagelijks werk van verpleegkundigen en verzorgenden. NIVEL, Utrecht: 2009. http://www.nivel.nl/sites/default/files/bestanden/rapport-morele-dilemmas-venv.pdf. Accessed 13 June 2016. Mayring P. Qualitative content analysis. Forum Qualitative Sozialforschung/Forum: Qualitative Social Research. 2000; 1(2), Art. 20. http://www.qualitative-research.net/index.php/fqs/article/view/1089. Accessed 13 June 2016. KNMG/KNMP. Richtlijn Uitvoering euthanasie en hulp bij zelfdoding, 2012. https://www-knmp-nl.proxy.library.uu.nl/downloads/richtlijn-uitvoering-euthanasie-en-hulp-bij-zelfdoding.pdf. Accessed 13 June 2016.